In September the mourning doves come through our area. They stay as long as they can. They love it here! Our area is full of cattle yards, abandoned farmsteads and weed fields. In the mornings and evenings we pass shoot them between water and feed. In the mid-day we jump shoot them in the wild hemp weed (yes hemp, that's why they fly so screwy). 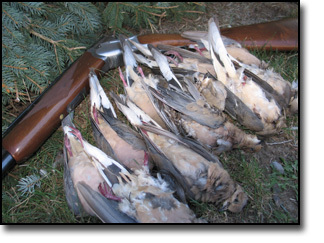 Bring lots of shells cause it takes most folks a lot of shooting to get your daily bag of 15 birds. Combines well with: Pheasant, Prairie Chicken, Sharptail, Prairie Dog. The Heartland has great dove shooting!